This week’s post is about helping you make the most of your stay in the city. Sites, museums, the city has something for everyone. We’ll tell you what not to miss, the places to go and visit and we’ll share with you some of our favorite restaurants. 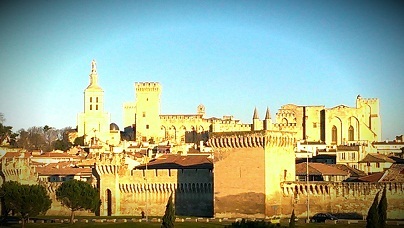 Avignon is located at the heart of Provence, so there’s a good chance that the sun will be shining when you’re here. As soon as you get to Avignon, there is one thing you should do: Head to the Rocher des Doms Gardens. The highest point of the city offers unique views over the Rhône River, the town center and nearby village Villeneuve les Avignon. You can even see Châteauneuf du Pape ! It is the perfect place to start your day in the city. After wandering around the gardens, head down to the Popes Palace, the world’s biggest gothic Palace. This impressive 14th century palace was home to the Popes when the city was the capital of Christianity. To know the history of the palace, audio guides are available. – L’ami Voyage, 5 Rue Prêvot. This book shop also offers home cooked meals and homemade cakes to die for. The menu is simple, yet delicious. Dish of the day like rabbit lasagna with wine and dessert for 14 euros only. Booking is advised, since it is well known by the locals. After your lovely lunch, take a walk to Avignon famous bridge “Pont St Bénezet”. The 12th century Bridge is one of the symbols of the city. Rebuilt several times, it was abandoned in the 17th after the Rhône River flooded. Before heading back to town for a bit of souvenir shopping, take the free boat shuttle to the “Barthelasse Island”, the biggest island on a river. The peaceful island offers stunning view over the city : the city walls, the popes palace and the bridge can be seen. That’s the perfect postcard view. The walk back to town only takes 15min. On the way back to your hotel, stop by “Rue de la Balance” for a bit of souvenir shopping. 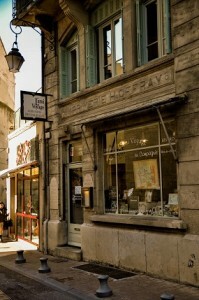 The street is your best bet for anything from Marseille soap, Provençal fabrics or other lavender products. EAT Restaurant just opened a year ago and is already well known on the Avignon Food scene. Run by a Franco-Spanish couple, the menu offers a healthy Mediterranean cuisine, made with fresh ingredients. EAT, Rue Mazan, booking advised. Join the original and only food tour in Avignon. AVIGNON GOURMET TOURS the 3h tour will introduce you to Provençal food, traditions and the city’s history. You will get to know the best artisans, visit the colorful central market and sample unique food products made the traditional way. At the end of the tour, you will try Châteauneuf du Pape, the region’s most famous wine. Tastings should be enough for you to skip lunch! 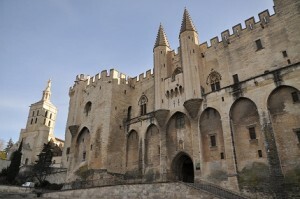 If there is one museum for you to visit in Avignon, we would recommend the “Angladon” Museum. With paintings from Cezanne, Picasso or Van Gogh, it is one of the most interesting in the city. Feel like having an Afternoon tea ? Autour d’une thé is the place to go. A tea room in the “Petit Palais museum” for a full afternoon tea with homemade cakes and specialty teas. If you feel like doing a bit of shopping, wander around the pedestrian streets for independent shops, Rue de la République for high street brands or Rue Joseph Vernet for Haute Couture Boutiques. For your last dinner in town we recommend you to try a restaurant that is one of the best rated in the city : Fou de Fafa, rue des 3 Faucons. Run by a British couple, Fou de Fafa offers French cuisine with a twist. Not to be missed. Booking mandatory !